All who knew Evelyn Gardner would agree that she was truly beautiful on the inside and out. She was genuine, gracious, and kindhearted, and as a longtime resident of the community she loved there was no one who met her and left unchanged. A loving wife and devoted mother, Evelyn was filled with unspeakable joy to witness her family tree blossom to include grandchildren, great-grandchildren, and great-great-grandchildren. Strong and independent, she didn’t shy away from taking matters into her own hands while at the same time her heart was as big as they come. Life will never be the same without Evelyn here, but she leaves behind a priceless collection of memories that her loved ones will forever hold near and dear to their hearts. It was great to be an American during the 1920s. Often recalled as the Roaring Twenties, this was the decade that welcomed conveniences such as the washing machine and refrigerator while cars were more affordable for the average American as they were mass produced on assembly lines. Amidst this exciting time was a time of great anticipation in the lives of Clarence and Melva (Geren) Pierce as they were eagerly awaiting the birth of their new baby as the holiday season appeared on the horizon in November of 1922 in Climax, Michigan. The big day finally arrived on November 26th when the baby girl they named Evelyn May drew her first breath. 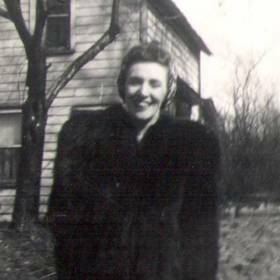 She was the fourth of 14 children in her family as she was joined in the Pierce clan by her older siblings, Foreman, Laverna, and Clarence, and her younger siblings, Carroll, Harry, Marie, Roger, Bessie, Norine, Mable, Rolland, Sandra, and Brenda. In many ways Evelyn was a young girl of her generation. She was raised in Kalamazoo, and as one of the older children in the family she often helped out with her younger siblings. With a big family and limited resources, Evelyn and her siblings made their own fun. Among her favorite activities were playing ball and dancing. Evelyn often followed her father to local events where he was a professional wrestler to make a little extra money. As a student she attended Kalamazoo Central through the 10th grade. New and exciting changes were in store for Evelyn when she met the man of her dreams. 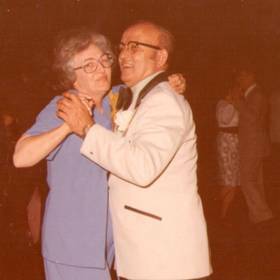 His name was Henry “Gene” Gardner, and they met one fateful night at a dance in Schoolcraft, Michigan. A short whirlwind romance followed, and they soon found themselves deeply in love. 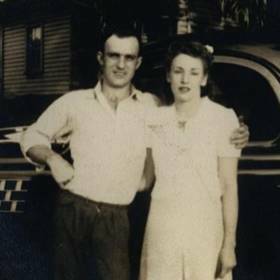 With a desire to spend the rest of their lives together, Evelyn and Gene were married on August 2, 1942, at the Justice of the Peace, Earnest Miller, in Marcellus. 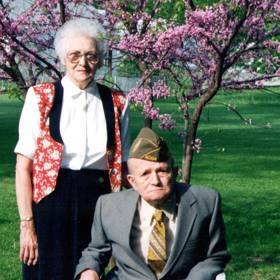 Soon after Gene and Evelyn were married, Gene lost his deferment status and was drafted into the Army. Prior to his deployment, the couple lived in Arkansas and Oregon. Once he was sent overseas, Evelyn returned to Michigan and bought the couple’s first and only house in Marcellus. Evelyn also worked at Ft. Custer during that time. While there, a German POW painted a stunning portrait of her, which has become a family treasure. Together Evelyn and Gene welcomed four children including Barry, Paul, Shirley, and Sharon into their hearts and home. Evelyn was the boss of the family, and she wasn’t afraid to discipline the children when needed. Of course the home was always a bustle of activity, too. During one of the additions to the house the boys put the razor strap inside one of the walls, and it remains there to this day. They are still the only ones who know which wall it is in! Over time, Evelyn went from boss to matriarch and then the glue that held the family together. Because she and Gene lovingly cared for her father for more than 20 years, there was plenty of extended family who was constantly in and out of the house. Their small house in Marcellus became a gathering place for celebrations and holidays with her children, grandchildren and great grandchildren. Evelyn was a fantastic cook and baker who was known for her pies. In addition to caring for her family, Evelyn kept busy in countless other ways. She was a well respected and well known person in the community of Marcellus as she worked in the schools and Ingersoll’s Drug Store where she gave many kids in the community their first job. She took her civic duties to heart as she rarely missed an opportunity to vote. Even this year Evelyn filled out her absentee ballot and made sure that her family delivered it to the clerk. Creative and talented, Evelyn enjoyed sewing and quilting, and she was a lifelong fan of both football and baseball. Throughout her life she was thrifty and paid cash for everything.  Later in life Evelyn experienced both peaks and valleys along her life’s journey. Although she was deeply saddened with Gene’s death in 1997, she stayed active for as long as she was able. Evelyn did some traveling out West, which she truly enjoyed. Over the past five years her health deteriorated, which eventually left her in a wheelchair. Despite her physical limitations, Evelyn’s mind remained sharp, and she treasured the companionship of her dog, Ginger. 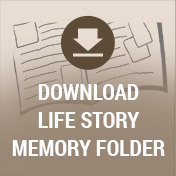 For the last couple of years of her life, Evelyn lived at White Oak Assistant Living in Lawton and with her daughter Shirley in Marcellus, however, she was able to come back home to Dibble Street, spend the final moments of her life. In everything she did, Evelyn Gardner thought of others first and foremost. She was independent and stubborn at times, never leaving anyone to wonder where they stood with her, but she was also just as sweet as they come. Evelyn forever viewed her wedding day as the best day of her life, and her family was her greatest treasure. Deeply loved, she will be forever missed. 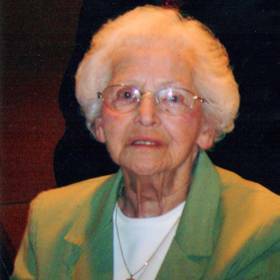 Evelyn M. Gardner, of Marcellus, passed away Tuesday, November 1, 2016. Evelyn’s family includes her two daughters, Shirley (Joe) Mroczek and Sharon Sweet both of Marcellus; two sons, Barry (Linda) Gardner of Dowagiac, MI and Paul (Laura) Gardner of Vail, AZ; two sisters, Marie Mackey of Portage and Mabel Holmes of Fennville, MI; grandchildren: Monica, Dawn, Chad, Paula, Paige, Austin, Geren, Nick, Luke, Rachel; great-grandchildren: Brandon, AJ, Drew, Abby, Conner, Miranda, Kyle, Owen, Reese, Joey, Magen, Jake, Mallory, Melanie, Stan, Eve, Luke, and Scarlet; two great-great grandchildren: Brinley and Baylen; and several nieces & nephews. Evelyn was preceded in death by her husband, Henry, six brothers and five sisters.